*Area, Population and Density rankings refer to Monkton’s relative position among Vermont’s 255 civic entities (9 cities, 242 towns, 4 gores and grants). Complete rankings are here. Despite the difference in spelling, Monkton probably was named for General Robert Monckton (1726-82). He was the second surviving son of John Monckton, the first Viscount Galway, and a grandson of John Manners, the second Duke of Rutland. He entered the army as an ensign at fifteen, rose steadily through the ranks, served in Flanders and Nova Scotia, and was Wolfe’s second in command at Quebec in 1759. In 1761 he was appointed Royal Governor of New York, a post he held officially until 1763, although part of the time he was away from New York in command of the successful expedition against Martinique, which resulted in its surrender in 1762. During much of the two years that General Monckton was governor of New York, Lieutenant Governor Cadwallader Colden actually was in authority, and frequently did not reflect his superior’s views. General Monckton was well thought of by his contemporaries, one of whom said that he was the “best type of English officer . . . just and moderate in his American dealings. ” Evidence of his efforts to be just is seen in the request he made of the New York colony’s Council, when he asked them to determine where it felt the eastern boundary of New York lay. It was the opinion of the Council that the boundary was a line twenty miles east of the Hudson River. As a result, General Monckton was the only royal governor of New York who never issued any land patents within what is now Vermont. Most present-day maps show the town’s main village as Monkton Boro, although the postal name is just Monkton. At different times the hamlet has been known as The Borough, sometimes spelled Boro, or Burrough. 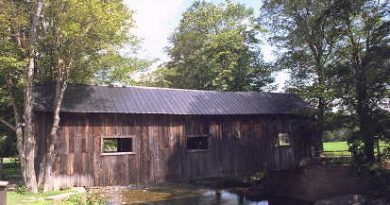 Originally in England a borough was a group of fortified houses forming a town; in the US a borough has come to be a municipal corporation (e.g., the constituent political divisions of New York City); in Vermont, it is usually is just a cluster of houses within a town, and is without political identity. 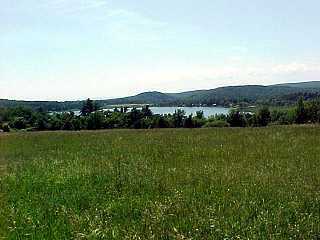 Overlooking a small body of water in the northern section of town is the village of Monkton Ridge; the body of water there was called simply Monkton Pond from the time the town was settled until a few years ago, when it was renamed Cedar Lake because of the fine stand of cedar that casts its reflection on the surface of the water. Maps of the 19th Century show iron ore beds in the southern section of town. Although the deposits are not now being worked, the bog iron ore from Monkton is said to have been of a very fine quality. The cannonballs for Macdonough’s fleet, which was built in Vergennes during the War of 1812, were fashioned from Monkton iron.